A clever little portable power pack with built in solar and car charger, simply wire a solar panel with under 25VOC directly to the unit with out the need for a charge controller as its built into the unit, or just connect to car when running. Great to use with our portable folding panels as an easy lightweight solar solution. A lithium-ion battery pack with intrinsically safe LiFePO4 cells, a built-in charger, and which is suitable for excessive discharge current. 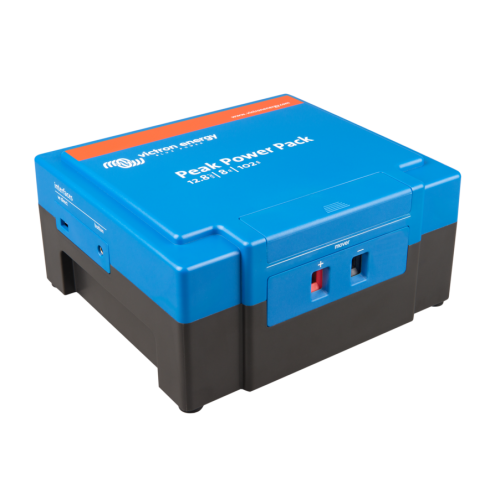 The Peak Power Pack can be charged from your car, and likewise via a solar panel or from the mains connection on your campsite. If you charge the battery whilst driving, the battery will be fully charged for manoeuvring your caravan when you arrive. Thanks to the cable supplied, the Peak Power Pack is extremely easy to use. A push button operates a built-in LED light with different colours which indicates the status of the battery. Built-in solar energy, regulating and charge unit. Can be kept in storage for a year (low self-discharge). Regulating system for extra-long service life. Li-ion system with internal charger.